A swim race is broken down into a start, turn, and free swimming phases. Although shorter, the start and turn are vital aspects of the race, especially races of shorter distances. Practicing the start and turn can improve ~0.1 seconds per phase, a large sum in longer races. The easiest method for measuring start and turn performance is to measure speed and time to a fixed distance, typically 7.5 and/or 15 meters from the wall. Unfortunately, these methods do not isolate the start and turn, as each swimmer must perform stroking before the 15-meter park. If using the 15-meter distance overestimates the start and turn race segments. This method measures exactly when the swimmer’s head breaks the surface of the water. 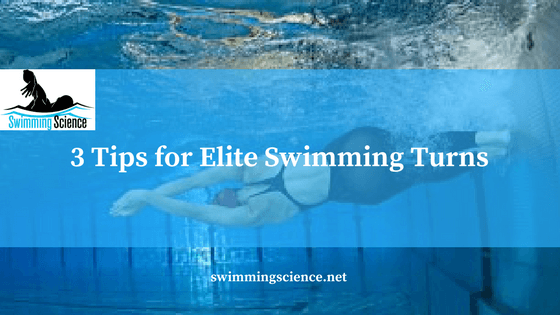 Previous work using this individualized turn method have not analyzed elite swimmers or race situations. Knowing differences between elite and regional caliber swimmers is essential for helping regional swimmers become more elite. Veiga (2014) analyzed races from the 2008 Open Comunidad de Madrid for 100 and 200-m events (long course meters). The elite swimmers had FINA scores between 700 – 900 points and the regional swimmers had FINA scores between 500 – 700 points. Traveled longer off the walls during butterfly and backstroke start and turns and the 200-m breaststroke turn. Male swimmers had longer distances in all race segments, regardless of skill. The start and turn distances represented less than 24% for the 100-m and 22% of the 200-m races. The average velocity was faster for all the elite swimmers than the regional swimmers during all races. Differences in average velocity between race segments were obtained for all the events, regardless of the swimmers’ performance level or gender. The starting speed was 0.5–0.8 m/s faster than the free swimming speed, and average turning speed was 0.1–0.3 m/s faster than the free swimming speed. These results showed measuring simply to 15-meters accounts for 2 – 5 meter of excessive measurement. Another important observation was that swimmers traveled longer than previously reported. This difference may be from the evolution and greater stress on dolphin kicking over the past few decades. If you are a butterfly or backstroke specialist seeking improvements, improving your dolphin kick speed and distance is essential. Also, swimmers can improve their underwater kicking by starting their kicking after gliding in the speed range of 1.9 – 2.2 m/s. This could enhance their kicking distance ~1 meter. For breaststroke swimmers, perform longer glides during your underwater phase for the 200-meter distance. However, it is likely these elite swimmers only maximize the start and turn distances when a net gain in average velocity results. Veiga S, Cala A, G Frutos P, Navarro E. Comparison of starts and turns of national and regional level swimmers by individualized-distance measurements. Sports Biomech. 2014 Sep;13(3):285-95. doi: 10.1080/14763141.2014.910265. Epub 2014 Jun 13. By Dr. G. John Mullen received his Doctorate in Physical Therapy from the University of Southern California and a Bachelor of Science of Health from Purdue University where he swam collegiately. He is the owner of COR, Strength Coach Consultant, Creator of the Swimmer’s Shoulder System, and chief editor of the Swimming Science Research Review.